Discover how to make incredible pizza! Italy has a well-established and deserved reputation for producing high-quality food and tasty cuisine. Best known for pizza and pasta, Italian food also includes many excellent meat and seafood dishes, as well as excellent cheeses, and fabulous desserts. It has often been noted that Italy is a country of great regional variations - and that is certainly true, indeed the country was only unified in 1861 - and this fact is reflected in the diversity of Italy's regional cuisine. It should also be noted that Italy has been invaded many times over the centuries, as well as trading with many other countries, and this too is reflected in the national cuisine. Northern Italy's native products include balsamic vinegar, bolognese sauce (ragu), lasagna, mortadella (a heat-cured pork sausage, served as a cold cut) parmigiano (parmesan cheese) polenta (a dish made from boiled cornmeal), prosciutto (dry cured ham) and tortellini (stuffed pasta). Rice is grown in both Lombardy and Piedmont (although different types in these two regions), which is used to make risotto. Tuscan cuisine often features meat, white beans and unsalted bread. Mozzarella and pizza, not to mention sfogliatelle (Italian filled pastries) originate from Naples. Roman cuisine often uses pecorino (cheese made from sheep's milk) and offal. Rome is also known for its ultra-thin pizzas. Calabria (the region corresponding to the "toe" of Italy) is known for its spicy variety of salami. Sardinia is well-known for its lamb and pecorino (cheese made from sheep's milk). Sicilian cuisine is noted for its Arab influences in its cooking (with the use of lemon and pistachio), as well as for its seafood (including tuna and swordfish). Sicily is also the home of gelato (ice cream) and granita (a delicious semi-frozen dessert made using sugar, water and flavorings). Braciola - Thin slices of beef pan-fried with a little olive oil. It is often eaten as an appetizer with green salad or potatoes. 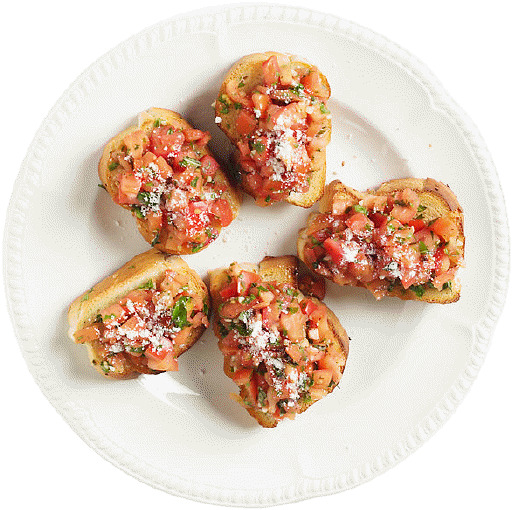 Bruschetta - Grilled bread rubbed with garlic, olive oil, pepper and salt. Additional toppings such as tomato, red pepper, vegetables beans, cheese or cured meat are also sometimes added. Gnocchi - Dumplings or noodles made from potato, wheat flour, or semolina. Minestrone - A thick soup made from stock with vegetables such as beans, carrots, celery, onions, and tomatoes. Pasta or rice may sometimes be added, and the dish is not necessarily vegetarian: meat or meat stock is often used when making it. Panna cotta - A dessert made by simmering milk, cream, and sugar, then mixing with gelatin. It is then allowed to cool and set. Panna cotta is often eaten with berries, chocolate sauce, or fruit coulis. Pasta - There are many different types of pasta including farfalle and rotelle (complicated decorative shapes), fettuccine and linguine (both ribbon-shipped), lasagna (large sheets), manicotti, ravioli and tortellini (hollow shapes which are stuffed with fillings), penne (short tubes), and spaghetti and vermicelli (string like). 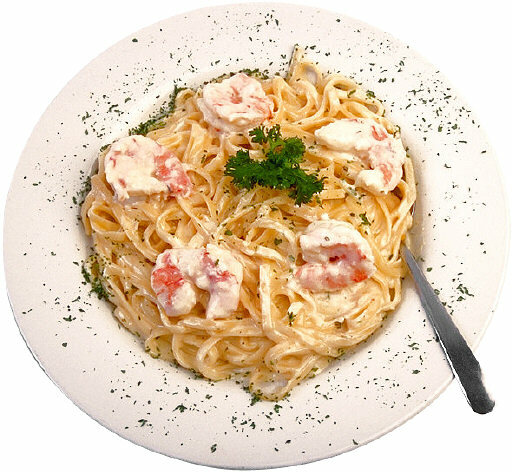 Each type of pasta is most suitable for a particular type of sauce (Alfredo sauce, Tomato sauce, etc. 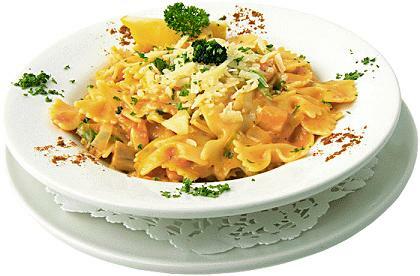 ), and thus a very wide range of different dishes can be prepared using each of these forms of pasta. 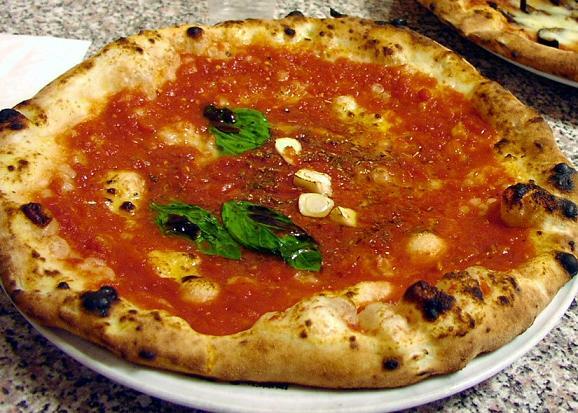 Lazio - A thick-base pizza, particularly associated with Rome, although available in other parts of the country too. There are quite a few different toppings that may be used, and this type of pizza is often made in long rectangular pans ("pizza al taglio" or "pizza rustica"). Neapolitan (Italian: pizza napoletana) - A pizza with a thin base made from Italian white flour. Marina, margherita, and margherita extra are the three official versions of the recipe. Ripieno and calzone - A half-moon shaped pizza filled mozzarella, ricotta and salami. It may be baked or fried. Sicilian (Italian: Sfincione) - A pizza with ingredients incorporated in the dough rather than used as toppings. Pecorino cheese is used instead of mozzarella, and these pizzas also usually include anchovies. Polenta - A kind of porridge made from boiled cornmeal. It is a staple food in Northern Italy. Risotto - A traditional Italian dish prepared from rice. The rice is first cooked in butter or olive oil, then white wine is added, and after this evaporates, hot stock is slowly added, stirring continuously. Diced butter or cheese is then mixed in, achieving a rich creamy texture. The basic recipe can be varied by using different kinds of wine or cheese, and by adding vegetables, meat, fish or seafood (cheese is usually omitted from the recipe if fish or seafood is used). Tiramisu - A dessert made from lady fingers (small sponge cakes known in Italian as "savoiardi") dipped in expresso, and sometimes brandy or sugar. Mascarpone cream, a custard made from egg yolks (zabaglione), Marsala wine, and sugar are then added, and cocoa powder sprinkled on top. Unlock the Secret of Making Pizza; Discover how to make incredible pizza! Learn How To Make Better Pizza In Your Own Kitchen Better Than You Can Buy At The Pizzeria. A timeless Mother's Day gift: The most important, consulted, and enjoyed Italian cookbook of all time, from the woman who introduced Americans to a whole new world of Italian food. Essentials of Italian Cooking is a culinary bible for anyone looking to master the art of Italian cooking, bringing together Marcella Hazan’s most beloved books, The Classic Italian Cook Book and More Classic Italian Cooking, in a single volume, updated and expanded with new entries and 50 new recipes. Designed as a basic manual for cooks of all levels of expertise—from beginners to accomplished professionals—it offers both an accessible and comprehensive guide to techniques and ingredients and a collection of the most delicious recipes from the Italian repertoire. As home cooks who have used Marcella’s classic books for years (and whose copies are now splattered and worn) know, there is no one more gifted at teaching us just what we need to know about the taste and texture of a dish and how to achieve it, and there is no one more passionate and inspiring about authentic Italian food. The experts at America's Test Kitchen and National Geographic bring Italy's magnificent cuisine, culture, and landscapes--and 100 authentic regional recipes--right to your kitchen. Featuring 100 innovative, kitchen-tested recipes, 300 gorgeous color photographs, and 30 maps, this illustrated guide takes you on a captivating journey through the rich history of Italian cuisine, region by region. Rich excerpts feature the origins of celebrated cheeses, the nuances of different wine growing regions, the best farmer's markets in Venice, and more. Intriguing prose illuminates key ingredients, from olive oil and how it's made to the various pasta shapes of Northern Italy. In every region, the food experts at America's Test Kitchen bring it all home, with foolproof recipes for standout dishes as well as hidden gems: Piedmontese braised beef in lustrous red wine sauce, crispy-custardy chickpea flour farinata pancakes from Genoa (achieved without the specialty pan and wood-burning oven), and hand-formed rustic malloreddus pasta of Sardinia that is a breeze to make. Fifty years ago, a group of Italian scholars gathered to discuss a problem: how to preserve traditional Italian cooking. They formed the Italian Academy of Cuisine to document classic recipes from every region. The academy’s more than seven thousand associates spread out to villages everywhere, interviewing grandmothers and farmers at their stoves, transcribing their recipes—many of which had never been documented before. This is the culmination of that research, an astounding feat—2,000 recipes that represent the patrimony of Italian country cooking. Each recipe is labeled with its region of origin, and it’s not just the ingredients but also the techniques that change with the geography. Sprinkled throughout are historical recipes that provide fascinating views into the folk culture of the past. There are no fancy flourishes here, and no shortcuts; this is true salt-of-the-earth cooking. The book is an excellent everyday source for easily achievable recipes, with such simple dishes as White Bean and Escarole Soup, Polenta with Tomato Sauce, and Chicken with Lemon and Capers. For ease of use there are four different indexes. La Cucina is an essential reference for every cook’s library. Unlike many Italian cookbooks, Autentico goes far beyond pasta. In a world where culinary shortcuts, adulteration, misleading labeling, and mass production of seemingly “authentic” food rule, culinary archaeologist, innovator and cooking teacher Rolando Beramendi has kept centuries-old culinary traditions alive. That’s authentic! In Autentico, Rolando details how to make classic dishes from Spaghetti Cacio e Pepe to Risotto in Bianco and Gran Bollito Misto as they are meant to be – not the versions that somehow became muddled as they made their way across the globe. Among the 120 recipes, you’ll find Baked Zucchini Blossoms filled with sheep's milk ricotta; Roast Pork Belly with Wild Fennel; Savoy Cabbage Rolls made with farro and melted fontina; Orecchiette with Sausage and Broccoli Rabe; Risotto with Radicchio; and a Lamb Stew with ancient Spice Route flavors that have roots from the times of Marco Polo and could have been served to the de’ Medici during the Renaissance. And of course, there are dolci (desserts): Summer Fruit Caponata, Meringata with Bitter Chocolate Sauce, and a simple, moist, and succulent Extra Virgin Olive Oil Cake. Colored by the choicest ingredients from the shores of Italy and beyond, the pages of Autentico offer a rich taste of the Italy’s history, brought to life in the modern kitchen. This beautiful cookbook, created in collaboration with Eataly, one of the greatest Italian food brands, features 300 landmark recipes highlighting the best of contemporary Italian home cooking. Excellent, fail-safe recipes and new ideas are presented in a sophisticated package, making this a must-have book for everyone wanting to learn about how Italians cook today. Gone are heavy pasta dishes and over-rich sauces - Eataly takes a modern approach to Italian cooking and eating. With recipes that are fresh and delicious, clear instructions, helpful tips, and a visual produce guide, this book will allow you to eat like Italians do today. The best Mother's Day gift for any mom who loves to cook. From the Emmy-winning host of Lidia’s Kitchen, best-selling author, and beloved ambassador for Italian culinary traditions in America comes the ultimate master class: a beautifully produced definitive guide to Italian cooking, coauthored with her daughter, Tanya—covering everything from ingredients to techniques to tools, plus more than 400 delectable recipes. Teaching has always been Lidia’s passion, and in this magnificent book she gives us the full benefit of that passion and of her deep, comprehensive understanding of what it takes to create delicious Italian meals. With this book, readers will learn all the techniques needed to master Italian cooking. Lidia introduces us to the full range of standard ingredients—meats and fish, vegetables and fruits, grains, spices and condiments—and how to buy, store, clean, and cook with them. The 400 recipes run the full gamut from classics like risotto alla milanese and Tagliatelle with Mushroom Sauce to Lidia’s always-satisfying originals like Bread and Prune Gnocchi and Beet Ravioli in Poppy Seed Sauce. She gives us a comprehensive guide to the tools every kitchen should have to produce the best results. And she has even included a glossary of cuisine-related words and phrases that will prove indispensable for cooking, as well as for traveling and dining in Italy. There is no other book like this; it is the one book on Italian cuisine that every cook will need. NOTE: Printings have an intentional light design on some pages as does all the printings of this book. A masterclass in creating delectable Italian dishes and the perfect gift for Mother's Day. From one of the most beloved chefs and authors in America, a beautifully illustrated collection of 150 simple, seasonal Italian recipes told with commonsense cooking wisdom—from the cutting board to the kitchen table. As storyteller and chef, Lidia Bastianich draws on anecdotes to educate and illustrate. Recalling lessons learned from her mother, Erminia, and her grandmother Nonna Rosa, Lidia pays homage to the kitchen sages who inspired her. Whether it's Citrus Roasted Veal or Rustic Ricotta Tart, each recipe is a tangible feast. We learn to look at ingredients as both geographic and cultural indicators. In Campania, the region where mozzarella is king, we discover it best eaten three hours after preparation. In Genova we are taught that while focaccia had its basil origins in the Ligurain culinary tradition, the herbs and flavorings will change from region to region; as home chefs, we can experiment with rosemary or oregano or olives or onions! When it's time for dessert, Lidia draws on the scared customs of nuns in Italian monasteries and convents and reveals the secret to rice pudding with a blessing.